Help us build a collection of water for future generations to enjoy. It is a brilliantly simple, elegant but powerful idea to ask people to create and contribute their own donations got people to think about the meaning and biography of water in all is meaningful, social, kinship-mediating, life-changing, political, joyous, tragic, multiple, slippery, fluid and leaky form. That warm sunny evening stayed with me as I cycled home (alongside a canal), but the rest of the year since then. So when I read that it was going to be held again (with a great set of accompanying events), this time in the grander and more watery setting of Somerset House on the banks of the River Thames, I felt compelled to visit it again. At Toynbee Hall, the ‘Corporation Pop’ had made me smile with its thrifty humour, but also because it was a smart demonstration of the curious properties of water. A simple glass of tap water, so described by someone’s grandparents, it the only exhibit not in a bottle, being ever replaceable, interchangeable and yet meaningfully the same, ‘next time’ out of the tap. Now I found a bottle of ‘Clapton Damp’, and the attendant frustrations and health concerns that come with living in a damp flat. (Since my last flat caused mold to grow on both my wooden kitchen utensils and leather shoes, I could only commiserate). Several other people had contributed snowballs (now melted), the holy water of a range of religions (Zam Zam collected on Hajj or Ummrah, water from several sites along the Ganges, from Catholic shrines), some pre-packaged, others collected by pilgrims themselves. 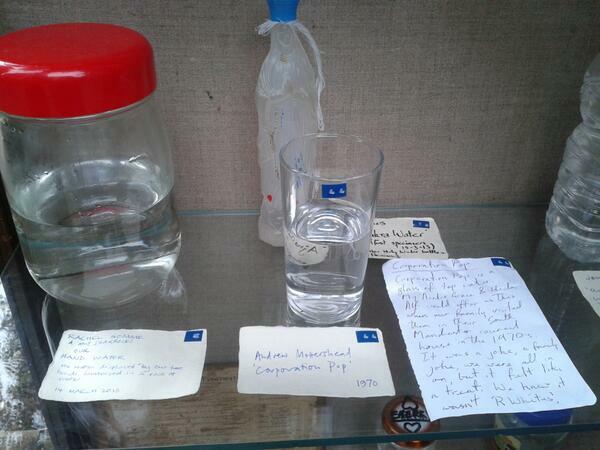 Some was pond water, some was gym water (in a Fire and Rescue Services bottle). Several bottles were from swimming baths, one apparently donated by a woman who had campaigned successfully to save Brockwell Lido (somewhere I’m sorry not to live closer to anymore). Several were very moving, more than one bottle of tears, but particularly the water collected by a woman the day her partner died some years ago, which had gradually evaporated with time, along, she hoped, with her grief. In fact, the gradual evaporation of the donations was another interesting dimension of the Museum. The ephemerality of water (another donation had consisted of ‘mist’ collected, several of ice), visibly present, but all the time slowly disappearing by entropy out of its containers. A little like the fine detail of memory there, but fragile, liking all kinds of powerfully meaningful and emotional aspects of life together, just as water at once escapes containers imperceptibly, as much as it carves valleys in the form of streams. A powerful kind of magic trick. I was happy to meet Amy again, who was kind enough to point out my donation of Delhi water on its shelf, and add that my short account of where I guessed it had come from on its journey into my water bottle had got her thinking about water distribution. I had no idea until she told me that London has a circular water main delivering water around the city, somewhere between the ring main of a house distributing electricity and the M25. She was also collecting interviews with donors (both the collection and soon the sound archive will be on the Museum of Water’s website), and I was excited to hear that she will soon be taking it not only to several UK festival, but overseas to Copenhagen and if I remember rightly to New York. I have to confess that I still think the Museum of Water would be an amazing thing to take to Delhi, perhaps in collaboration with a collective like Khoj at the back of Malvyia Nagar, in the streets of Khirki Ex, and one of the malls at Saket. So many similar, powerful questions and emotions linked to water and everyday life, place, social relations, notions of dirt, difference, mixing, of religion, neighbours, scarcity, and status abound in South Asia, arguably more so than in the UK, and no less powerful in the face of climate change. For myself, I find the Museum of Water project compelling for two reasons. Firstly that it seems to reach people with a remarkable strength of emotion and meaning, in a way that social and historical research often struggles to – in a way that is complex, nuanced and powerfully intelligible in an almost primordial way. There is much to learn from this project in that sense. Secondly, because the everyday life of water remains an animating theme in project, even as I’m principally interested in dengue, as it is the linking medium between mosquitoes and humans. Water is hard to study for its ubiquity, it gets away from one in its material properties that allow it to both flow out of ones control and lift into the air as vapour, but it is indispensible and consequently links us all together, to each other and the wider world in a way that is also inescapable. Tags: art, emphemeral, London, materiality, memory, practice, UK, water | Permalink.